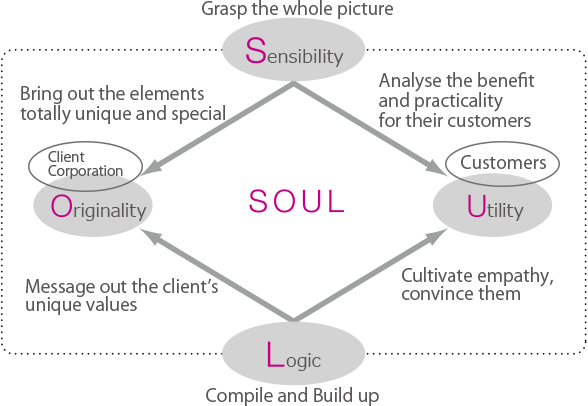 Our first priority in brand name development is SOUL. Names of company, business brand, product, service, area, and so forth. In any cases, the name is the most effective instrument to deliver its own value. Therefore, the only several letters are required to offer a lot of information. For this purpose, we have to share the idea and thought with our clients, understanding the characteristics of the object. It is essential to ascertain the points to be appealed. On the other hand, in order to establish a name as a brand, it is indispensable to achieve acceptance of the targeted customers. For that purpose, an objective viewpoint of development from the customers’ side is required. In other words, naming is an operation to integrate the intentions of both corporations and their customers into one word. And, combining the first letters of the four words, a word SOUL appears. We have a firm belief that only names created with SOUL obtains a favorable response from many people, and promises growth as a strong brand. What is essential for naming development, is a viewpoint of both corporation as a provider of services or products and their customers as receivers. How the object of naming is accepted by customers or the society? How it grows with a certain name developed? It is especially important to get an overall picture and desirable image of the future. Aiming at differentiation from rivals, and having a strong presence, ‘originality’ is indispensable. With a safe name without individuality, it is difficult to establish its own clear identity. A name with an absolute originality which shows a strong presence, is created by analysis of essential value, such as individuality and strong points of the corporation, or character of goods. Names should be practical for both corporation and customers. Therefore, careful verification of functionality in assumed usage environment, for instance, simple pronunciation, easiness to hear or memorize. Also, suggestion of a name which can be coordinated with a logo or advertisement makes it possible to build a consistent brand image. After clarifying various ideas drawn by ‘Sensibility’,’Originality’ and ‘Utility’, compiling the ideas into a word of several letters; it is the most demanding process of name development. Logical construction is required. A name backed up by certain logic has a sure presentation capability and persuasiveness. It captures attention of corporations and customers.